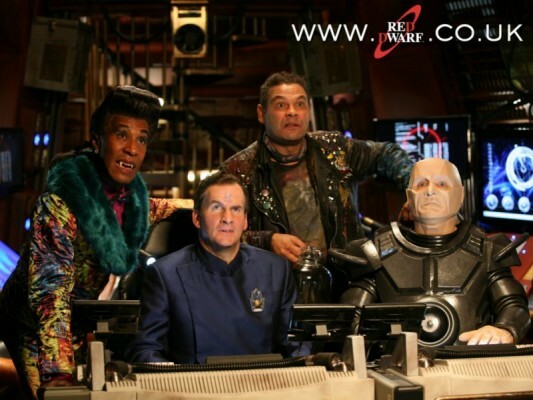 Red Dwarf: Summer 2016 Premiere for Series XI? Brit sci-fi comedy, Red Dwarf, set on a spaceship of the same name, premiered on BBC Two in 1988 and ran until 1993. After a four year hiatus, Red Dwarf returned to BBC Two in 1997. Red Dwarf was cancelled in 1999, after series VIII (Americans: season 8). In 2009, UKTV channel, Dave, revived the program with Red Dwarf IX. Dave aired Red Dwarf X in 2012. Now after another long break, it’s possible Red Dwarf XI could air on Dave in the summer of 2016. Red Dwarf stars Chris Barrie, Craig Charles, Danny John-Jules, and Robert Llewellyn. Continue on for more details, and to watch a brief promotional trailer. There are no exact dates yet, but XI is expected to land on Dave in the summer of 2016 at the earliest. Writer and co-creator Doug Naylor recently denied reports that it could be as early as the spring, so we could be waiting up to a year for its launch. Red Dwarf will shoot two brand new series back-to-back, starting in October 2015. Series XII is expected to follow on Dave in 2017. What do you think? Are you a fan of the Red Dwarf TV series on UKTV’s Dave channel? Do you plan to watch Red Dwarf XI? More about: Dave TV shows: canceled or renewed?, Red Dwarf, Red Dwarf: canceled or renewed? 8 is viii, not xiii.